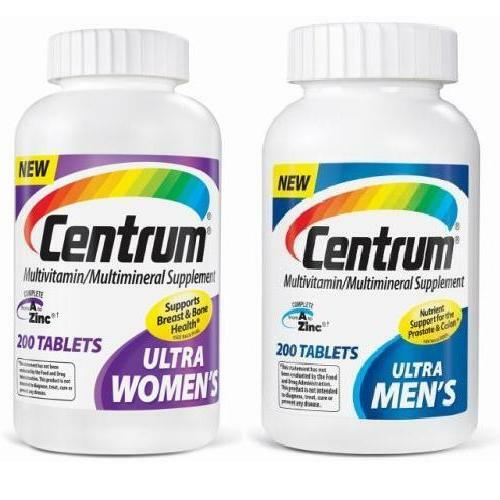 Centrum is a brand of vitamin supplements and is offered in several different tablet or liquid formulas; these varying formulas are designed to meet the diverse nutritional needs of age and gender, as well as promoting overall health. Centrum supplements are available in the following formulas; prenatal, vision, energy, heart, age 50 and under, and age 50 and over; many of these formulas are also geared toward male or female use. These supplements are usually taken once per day with or without food; you should not take Centrum if you are allergic to any of the ingredients listed on the bottle. Centrum can be used to treat low vitamin or mineral levels in the body and may also be recommended by your doctor to treat other conditions. This product may be beneficial in providing you with the vitamins and minerals you need on a daily basis that are not met through diet alone. Vitamins are imperative to many of the body’s natural processes and may also help regulate the multitude of chemical activities that are constantly occurring within your body. Certain medical conditions may require special tests or dosage adjustments to ensure you can safely take Centrum. Centrum should be taken by mouth with or without food as directed; it is important to remember to take it every day if you doctor has advised you to, otherwise it is not largely significant if a dose is forgotten. 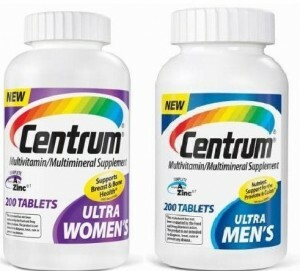 You should not take large quantities of other vitamins while you are taking Centrum. If you take a bisphosphonate medication, you should wait 2 hours after taking it before you take Centrum. You should also talk to your doctor before taking a quinolone antibiotic or a tetracycline antibiotic with Centrum to ensure that you take them together correctly.